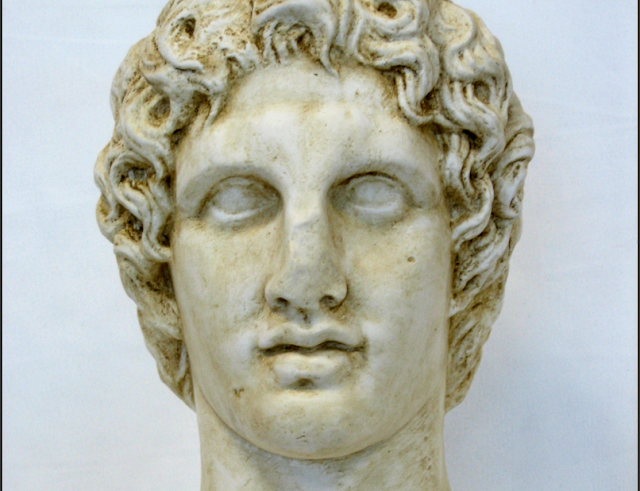 Alexander III of Macedon was born today (or tomorrow) July 20 (or 21) in 356 BC. He was born on the sixth day of the ancient Greek month of Hekatombaion, which probably corresponds to July 20 356 BC, although the exact date is disputed. He was commonly known as Alexander the Great and was a king (basileus) of the ancient Greek kingdom of Macedon[a] and a member of the Argead dynasty. He was born in Pella in 356 BC and succeeded his father Philip II to the throne at the age of 20. He spent most of his ruling years on an unprecedented military campaign through Asia and northeast Africa, and he created one of the largest empires of the ancient world by the age of 30, stretching from Greece to northwestern India. He was undefeated in battle and is widely considered one of history's most successful military commanders. During his youth, Alexander was tutored by Aristotle until age 16. 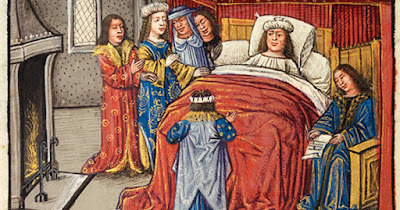 After Philip's assassination in 336 BC, he succeeded his father to the throne and inherited a strong kingdom and an experienced army. Alexander was awarded the generalship of Greece and used this authority to launch his father's pan-Hellenic project to lead the Greeks in the conquest of Persia. In 334 BC, he invaded the Achaemenid Empire (Persian Empire) and began a series of campaigns that lasted 10 years. Following the conquest of Anatolia, Alexander broke the power of Persia in a series of decisive battles, most notably the battles of Issus and Gaugamela. He subsequently overthrew Persian King Darius III and conquered the Achaemenid Empire in its entirety. At that point, his empire stretched from the Adriatic Sea to the Indus River. He endeavored to reach the "ends of the world and the Great Outer Sea" and invaded India in 326 BC, winning an important victory over the Pauravas at the Battle of the Hydaspes. He eventually turned back at the demand of his homesick troops. 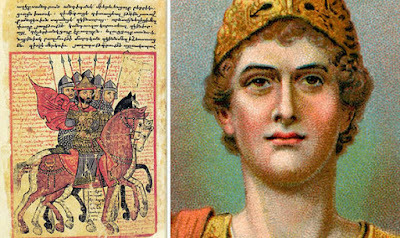 Alexander married three times: Roxana, daughter of the Sogdian nobleman Oxyartes of Bactria, out of love; and the Persian princesses Stateira II and Parysatis II, the former a daughter of Darius III and latter a daughter of Artaxerxes III, for political reasons. On either June 10 (or 11) 323 BC, Alexander died in the palace of Nebuchadnezzar II, in Babylon, at age 32. 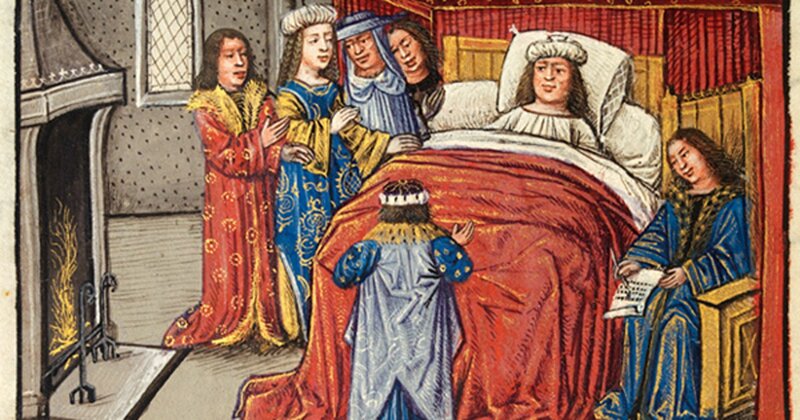 There are two different versions of Alexander's death and details of the death differ slightly in each. One account is that roughly 14 days before his death, Alexander entertained admiral Nearchus, and spent the night and next day drinking with Medius of Larissa. He developed a fever, which worsened until he was unable to speak. The common soldiers, anxious about his health, were granted the right to file past him as he silently waved at them. In the second account, Diodorus recounts that Alexander was struck with pain after downing a large bowl of unmixed wine in honour of Heracles, followed by 11 days of weakness; he did not develop a fever and died after some agony. Alexander's legacy includes the cultural diffusion and syncretism which his conquests engendered, such as Greco-Buddhism. He founded some 20 cities that bore his name, most notably Alexandria in Egypt. Alexander's settlement of Greek colonists and the resulting spread of Greek culture in the east resulted in a new Hellenistic civilization, aspects of which were still evident in the traditions of the Byzantine Empire in the mid-15th century AD and the presence of Greek speakers in central and far eastern Anatolia until the 1920s. Alexander became legendary as a classical hero in the mold of Achilles, and he features prominently in the history and mythic traditions of both Greek and non-Greek cultures. He became the measure against which military leaders compared themselves, and military academies throughout the world still teach his tactics. He is often ranked among the most influential people in history.